Some homebrewing procedures are complex while others are simple. However, just because a process is simple doesn’t mean that it is not important. Wort cooling is a procedure that is conceptually simple, yet very important to beer quality. Unfortunately, since wort cooling is straightforward and comes near the end of the brewday, many homebrewers pay little attention to this step. After the boil, wort needs to be cooled for a variety of reasons. The wort needs to be cool enough for the yeast to survive and perform well at making beer. Most ale yeasts work best between 68–72° F (20–22° C); most lager yeasts work best at 45–57° F (7–14° C). In addition, to prevent shock from a rapid change in temperature, the temperature difference between your yeast culture and wort should be less than 10° F (-12° C) at pitching. There are reasons other than yeast health for wort chilling. Wort cooling causes solids, called the cold break, to form and fall out of solution. When wort is transferred from the kettle to the fermenter, this break material is left behind. Wort cooling also slows dimethyl sulfide (DMS) production. DMS is a volatile substance produced in some worts, mostly those made from lager malts. DMS smells like cooked corn and is usually considered a beer fault, although it is noticeable and intentional in some commercial beers. Quickly cooling the wort also slows growth of some wort contaminants. Once the wort drops below 160° F (71° C) or so, there are many bacteria — known as wort spoilers — that can quickly grow and produce off flavors in wort. Quickly moving the work to fermentation temperature and pitching the yeast minimizes the impact of these bacteria on your beer. Many homebrewers start their fermentations “warm.” Instead of cooling the wort all the way down to fermentation temperature, they stop cooling 5 to 10 degrees Farenheit (3 to 6 degrees Celsius) short and then pitch their yeast. The usual reason given is that a warm wort provides for a fast start, which will help the yeast colonize the wort faster and crowd out any stray bacteria. When deciding whether to start warm or not, there are a couple things you should consider. A warm wort will lead to a faster start for the yeast. But it will also propel any bacterial contaminants to grow faster as well. Since bacteria can divide faster than yeast, you really aren’t gaining any leverage by starting warm. Many flavor-active molecules are produced early in the fermentation while the yeast are multiplying. These molecules are produced in much smaller numbers later when the yeast cells have reached their maximum density and are fermenting, but not dividing. Thus, starting a fermentation warm can lead to more fermentation by-products in your wort. If you are striving to make a “clean” tasting beer, starting at fermentation temperature is more advisable. Starting warm also means that more potential cold break material remains dissolved in the wort. Some of this material can contribute to chill haze in your finished beer. Homebrewers have a few options when it comes to wort chilling. Extract brewers typically boil a concentrated wort, a wort smaller than the volume of the batch. After the boil, water is added to make the batch full-size. For example, the brewer may boil three gallons (11 L) of wort, then add two gallons (7.6 L) of water to make a 5-gallon (19 L) batch of beer. Obviously, the water used for topping up can absorb a good deal of heat. To increase the “cooling power” of this water, it can be refrigerated overnight. Make sure the water containers are clean and sanitized and that the containers can be sealed. Water stored in a refrigerator can pick up flavors from food if it is not in a sealed container. Before mixing this water with your wort, aerate the water thoroughly. You can do this by vigorously shaking the container for 45–60 seconds, or you can use a fish-pump aeration device or oxygen tank. Cold liquids can hold more gas than warm liquids, so aerating your cold topping-up water can help greatly with overall aeration. When mixing cold water and hot wort, add the cold water to your fermenter first, then slowly add the hot wort. Stir the wort with a clean, sanitized spoon as you mix the two. Never add hot wort to a carboy before the cold water, as the heat can crack it. One disadvantage of transferring hot wort into cold water without chilling it first is you carry all the potential cold break into the fermenter. If you want to get rid of this break material, you can initially transfer the wort to cold water in a sanitized bucket and wait for 15 minutes or so for the break material to settle out. Then, you can siphon the clear wort to your primary fermenter. A five-gallon or smaller wort can easily be cooled by submerging your brewpot in a sink. This transfers heat from your wort to the water. To do this, put a cover on the brewpot after the boil, place the pot in a sink and fill the sink with cold water. To speed cooling, swirl the water in the sink every couple of minutes and change the water in the sink every five to seven minutes. Also, stir the wort with a clean, sanitized spoon every time you change the water. These two things will keep cold water next to the outside of the pot and hot wort next to the inside of the pot. Once the brewpot has cooled to the point where you can comfortably touch it for a few seconds, put some ice in the sink and fill it with water. You will need a total of about three to four pounds of ice per gallon of wort to cool it quickly. The exact amount depends on how cold your wort is when you begin icing it. Keep changing the cooling water and adding more ice every time the ice melts. Begin checking the temperature of your wort — with a clean, sanitized thermometer — once the brewpot is cool to the touch. Once the wort is cooled to your target temperature, transfer it to your fermenter. Even if you add some cold topping-up water to your wort, cooling the brewpot in a sink or tub is a good idea. If hot wort is splashed around, it can darken significantly. This can occur even if you are pouring the hot wort into cold water, especially if you’re pouring it through a funnel. Whatever you do, don’t pour hot wort through a strainer — this will definitely darken the wort and leave your beer prone to quick staling. And finally, hot wort can cause scalds — so anytime you cool it before moving it anywhere, the better off you will be. I always cool any wort — even the wort I make for yeast starters — before transferring it. This ensures that my light-colored worts (or starter worts) stay light-colored and I don’t risk scalding myself. Cooling the wort before transferring also allows you to separate the wort from some of the cold break material. If you are cooling your wort in the sink plus adding topping-up water, you don’t need to cool the wort all the way down to fermentation temperature. Simply cool the wort to the point where you can comfortably touch the brewpot for a few seconds, then transfer the wort to your fermenter. It’s possible to cool five gallons or more of wort in a sink or bathtub, but it would take awhile. Plus, you would need to carry the wort to the water and this could be dangerous. Luckily, homebrewers have a safe, effective way of cooling a wort without having to move it — with an immersion chiller. 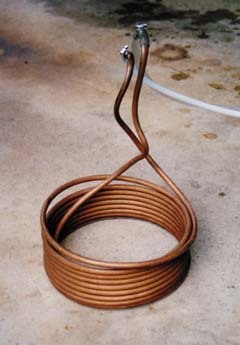 An immersion chiller is a metal coil — usually copper — that is placed in hot wort. It has tubing or hoses running from both ends. Water running through the coils absorbs heat and carries it out of the wort. When used correctly, an immersion chiller will cool a wort much faster than cooling the brewpot in a kitchen sink. To use an immersion chiller, place the clean chiller in your wort about 15 minutes before the boil is done. The heat from the wort will sanitize it. Hook one end of the chiller tubing to your water source and place the other end in a sink, near a drain or anywhere that can accept hot water. You may need to weight down the “out” end so it stays put. After the boil, turn on the water to the chiller. Using a clean pot holder or barbecue mitt, grab the top of the chiller and swirl it through the wort a few times to start the wort circulating. (Don’t let the pot holder touch the wort.) The circulating wort will flow past the chiller coils and keep cold wort from collecting around them. Swirl the wort every five minutes or so. Putting a lid on the kettle slows the cooling slightly, but it prevents air-borne contaminants from falling into your wort. Once the outside of the kettle is cool to the touch, take the temperature of the wort every five minutes or so with a sanitized thermometer. When your wort is cooled, transfer the wort to your fermenter. Another way to cool your wort is with a counter-flow chiller. A counter-flow chiller is essentially a tube within a tube. Hot wort flows into the chiller and travels through the inner tube. Cold water flows in the opposite direction through the outer tube. As the wort moves through the chiller, it encounters ever-colder water and continually transfers heat to this water. Some chillers are made out of copper while others are made with nylon tubing run through a garden hose. Copper conducts heat much better than tubing, but is also more expensive. Counter-flow chillers are commonly attached to a valve on the kettle. After the boil, the water is turned on and the valve is opened. Hot, clear wort flows into the chiller and cooled, cloudy wort exits the other end. A counter-flow chiller will quickly cool your wort down to pitching temperature, but the wort that comes from it will be cloudy. The wort is cloudy because it contains all the precipitated cold break solids. To get rid of this, you can direct your wort from the chiller to a sanitized bucket first. Once the break material has settled to the bottom of the bucket, you can transfer the wort to your fermenter and pitch the yeast. The temperature of the wort exiting the chiller depends on a number of factors. Colder water temperatures, longer chiller lengths, more turbulence within the chiller and a slower flow rate of the wort increase the “chilling power” of the chiller. If you measure your wort temperature as it exits the chiller, you can change the wort flow rate with a tubing clamp to hit your target temperature. One concern many homebrewers have with counter-flow chillers is that they cannot see the inside of the chiller to see if it’s clean. Running hot water through the wort line of the chiller immediately after use will help keep it clean. Follow the hot water with a cleaning solution. To sanitize, you can run sanitizing solution through the wort line or boil the entire chiller. If you boil, fill the chiller with water first, place it in your kettle and heat the water to boiling. Don’t dunk a cold chiller into boiling water as that can cause air inside to expand rapidly, and spray hot water from the tubes (and potentially damage the chiller). Following cooling, you will need to aerate your wort and pitch your yeast. Some brewers have built aeration stones into the wort outflow tubing on their chillers for aeration. Quick wort chilling — followed by cold break separation, if needed — will give your yeast cool, clear wort to live, grow and ferment in.